Oakley's new Prizm lens technology is a project that required about 15 years for engineers to complete. From experience, these lenses are mind-blowing. 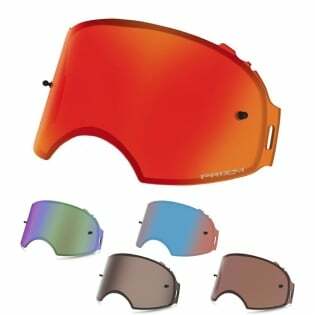 According to Oakley, the Prizm lenses are sport-tuned for maximum contrast and purpose built for the motocross environment to dramatically enhance visibility and contrast. The lenses were engineered to help you perform over a wider range of lighting conditions, reducing the need to switch lenses as lighting conditions change. Prizm™ MX lenses help you see subtle transitions in dirt conditions so you can master all those split-second decisions. Mother Nature has a ton of gears, and she’ll shift on you without warning. Be ready for any light condition. These replacement lenses cover the full range. Oakley engineered them for their premium Airbrake™ MX Goggle and each one is made of durable Plutonite® with anti-fog technology. You’ll have full-on UV protection, impact resistance and a level of clarity worthy of the world’s most technically advanced performance goggle. Why is this important? For motocross and off-road riding, being able to distinguish between a dry, wet, muddy, or sloppy section of track normally depends on what color the dirt is. Also, when picking lines we use shadows and dirt color to see ruts, bumps, holes, and other track irregularities, which is supposed to be easier with the Prizm Lens. For off-road riding, picking out tree trunks or embankments amongst the foliage is also a huge boon. "After a day on the track with the three different Prizm Lenses (MX Bronze, MX Black Iridium, and MX Jade Iridium) there is a noticeable difference between just a dark lens and the Prizm. The effect is basically like everything gets a little darker (not much darker) but colors are still bright and pop to the eye much more than a tinted lens. The Bronze has no coating and is the base lens for light or dark riding. The Jade makes greens stand out more and would be best for off-road riding. The Black is the darkest and is designed for full sun conditions."